I was invited by the Department of Geodesy and Geoinformation from the Vienna University of Technology to give a guest lecture regarding ICT4D. 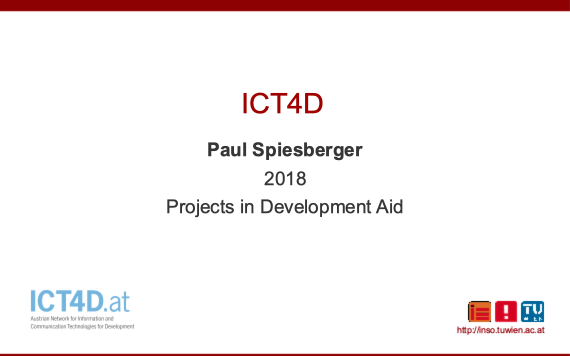 I will give a short overview, talk about the history and where the ICT4D community is currently heading. There will be a focus on practical projects from our past, since they lecture titles Projects in Development Aid. Goal of the lecture is showing the participants the challenges of development aid projects. The participants will see that skills like social competence and flexibility are essential for success. The focus of the course is the development aid program Appear (Austrian Partnership Program in Higher Education and Research for Development). After a general introduction, five speakers will present their respective projects. An essential aspect of the lectures are, in addition to the problem definition and the (technical) solution, the challenges of working in developing countries, dealing with inadequacies of the infrastructure, political developments, social challenges, economic conditions, etc.